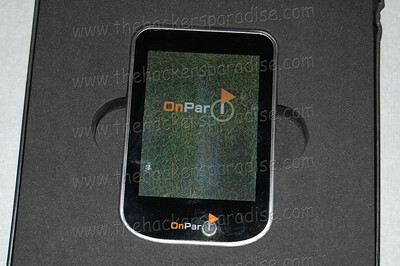 The Hackers Paradise first got to test drive the OnPar GPS at the PGA Merchandise Show earlier in the year. From that point, we knew it was a device that we could not wait to get our hands on and give it a test run. 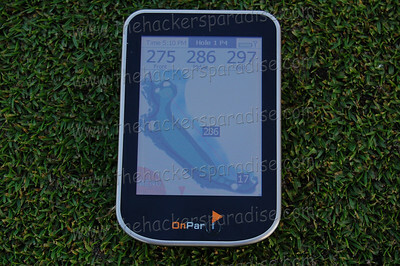 The OnPar GPS is a unique device in the golf distance measuring device market. A couple of things stand out right away that drew our attention to it and the first is that the device is run completely by touchscreen. The 2nd part that stands out to us is the fact that there are ZERO fees after purchasing the device that includes both course downloads and mapping. After learning about both of those features, we were excited and anxiously awaiting our GPS to arrive for testing. When the box arrived we quickly ripped it open to find a device that is as cool as we remembered. As a “tech junkie”, the cool factor of the OnPar GPS is extremely high. The back of the device is “rubberized” and the face is one large touchscreen. The box even comes with a “gel like” protective case you see for cell phones, so you do not have to spend any extra money on it. I also want to say that this device comes with instructions that are simple and laid out well to make sure anybody can set it up properly. 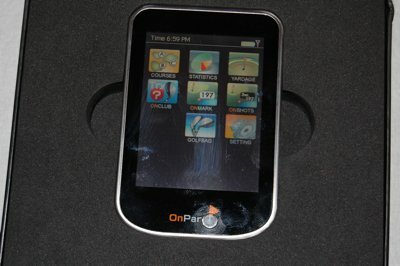 The OnPar GPS is about the same size as a cell phone (smartphone) and features only one button at the bottom for toggling the device on and off. Our initial impressions were sheer joy and we could not wait to set it up and get started in our testing. Setup is an absolute breeze after one little issue we figured out fairly quickly. The OnPar GPS is NOT compatible with Mac computers right now, so once we figured out that it had to be connected to a PC it was a breeze to complete. Step 2 – Turn on OnPar GPS and connect it to your PC with provided cable. Each step is carefully and clearly laid out in the intructions and a large picture is given as well with exactly what you are doing with each step. The setup is about as easy as any device we have ever encountered. The entire setup (minus the miscue of trying to use a Mac) took less than 10 minutes. THP is all about “multitesting” so we wiped the device and gave it to a person that is not tech familiar with the instructions and let them have at it for a little bit. It took 4 minutes longer for our senior tester to set it up, but the results were the same and they also reported that they had absolutely no problems or issues during the entire process. While downloading the courses to the device is quick and painless, we did find one major hurdle in the process. The lack of courses. In our area in FL, just about every course we searched for was listed and downloadable. However in our search test, we found far too many courses not available around the country. In further review, it seems as though the OnPar has a significantly smaller library of courses than that of their competitors. However please keep in mind that it is a new device and is being updated regularly. If the courses in your area are not listed, call the customer service and discuss it with them or you can map your own courses with no added fees. THP recommends checking the library of courses ahead of time before making any purchase like this. As of this review, OnPar has a library of about 6,000 courses in the US. We have been told that they will map requested courses in a timeframe of less than 30 days. 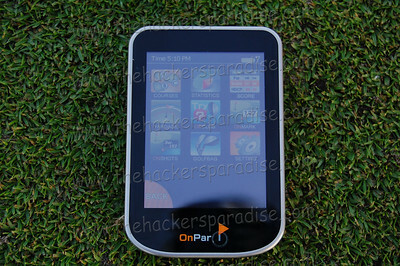 The OnPar GPS is the king of features when it comes to golf devices. This one is going to get lengthy. Shot Tracking – The OnPar has a great, easy to use interface for tracking your golf shots and even recommending what club to use for each shot. If you decide to track your shots for each round, the next time you play that same course, the device not only tells you what club to play, but also shows where your shots were placed and how you played them. After multiple rounds on my home course, I found this extremely helpful to show where I put the ball when I scored well. Others we have spoken with said that they just would not use this feature. Scores & Statistics – This is a feature that really shows off the touchscreen device. All you have to do to keep score is press the + or – after the hole. Number of putts per hole is tracked the exact same way. It even has both fairways and greens hit in regulation and to track that, it is a simple check mark. There was a small issue with the percentages as it said our eagle percentage was very high despite the fact that we had no eagles. Other than that, the stats feature worked flawlessly. Club Rec – The OnPar GPS will recommend the proper club for players if they save their distances to it. While this is not USGA allowed for handicap purposes, the feature can very easily be toggled on and off and we were informed that it does NOT keep this device from being legal for tournaments or anything else. The accuracy of the device is virtually dead on. We tested the OnPar GPS against a Skycaddie, as well as the GPS devices built into the carts at our club and every reading was spot on with both. The OnPar GPS holds 300 courses, so once you set it up, downloading others might be something you rarely have to do, which is a feature that we definitely liked. On the course the device works as described, you pull up to a hole and it gives you the distance to the front, center, and back of the green from the tee box. The screen is bright and we had absolutely no issues in the direct sunlight, as we even tried to find an angle with the device that made it hard to see the screen well. Pin Point accuracy is something we are seeing quite a few devices have recently. Other GPS units are using cursors to “zero in” on an object and give you the measurement to that, such as bunkers, trees, etc… The touch screen works a little differently than that in that all you have to do is touch whatever you want the distance to. For example, if there is a fairway bunker about half the way to the green, touch it on the overhead view of the hole and it will give you that distance, as well as the remaining distance to the hole. The OnPar GPS makes this feature truly easy to use compared to most, however we did find ourselves having to zoom in a few times to make sure we were tapping the right area of the screen. During testing a few players had a tough time using this feature to get it exact, but we really did not have the same issues. The screen will timeout in between shots and a simple click of the only button brings it back to life. As mentioned previously, the screen is as good as any we have come across. It gets brighter in direct sunlight so you never have any worries of seeing it well. One thing that many have asked about is the OnPar GPS is how is the battery life? The answer to that question is “so-so”. We get just about 2 rounds of use out of it, but as most do, I bring mine in after a round, so I just charge at that point. We would have liked to see a longer battery life, but that is the nature of touch screens and this battery gave us plenty and slightly more than we expected. The device does not have things pre-mapped such as hazards and markers, and we would have liked to see that done on some holes. While the pin point control gives you that ability and a whole lot more, playing a new course could open you up to obstacles you are not aware of and for that reason do not check for. But overall we found that between the accuracy of the device and the touch screen tapping to find distances around the course to all work well and as described. Mapping on the OnPar GPS is extremely easy to do. Go to the point on the hole you want mapped and press a button. That is it and now that mapped point will remain there for all of the rounds in the future. Once this is done, we had less issues with the OnPar premapping custom points on their courses. However, we would have still liked a few just for those courses you are playing and may not make it back to. We did this to two courses that we play regularly and I can tell you that after you have your areas mapped, this device is even better than it was before. 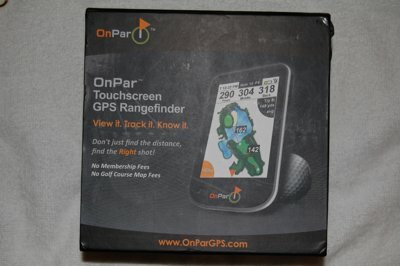 The OnPar GPS is available from their website (below) as well as most reputable golf retailers. The price we are seeing is around $400. At first that may seem extremely high compared to other options out there. However, further investigation will show that while the original lay out of money is higher, the three and five year costs are quite good. If you purchase another device that costs only $300, but has an annual membership of approximately $30. Within a few years the OnPar GPS will be a cheaper alternative. The OnPar GPS delivered a very strong contender to the GPS market. Like any device there are a few pitfalls, but the OnPar offers some huge advancements in the GPS market. If their course library continues to expand at the same rate as it has in 2009, this unit will be one of the best available. We want to add a little note that OnPar GPS has one of the best customer service departments we have ever dealt with. It is something we often test, and do not say who we are during the call, but the representatives were friendly, informative, and extremely helpful. Overall, we feel as though this GPS is worthy of consideration if you are looking for a distance measuring device on the market right now. It is packed full of features, no fees after purchase, and delivers on almost all of its promises and claims. 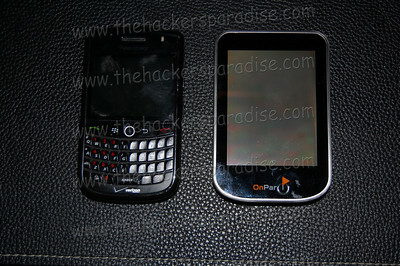 For more information on this device, check out their website at www.onpargps.com. Very thorough review of what appears to be a solid device. In other reviews I have read it appears people are having errors because this is running a form of Windows Mobile. Did you have any of those errors? We have read those reviews as well and tested this unit for close to a month daily. As well as supply the device to quite a few other golfers to try and we have not see one single Windows error to report on. Im not sure if other folks got defective units, or we just got lucky, but I am just not seeing it. Thanks. I am really liking the looks of this. I have a Skycaddie that I bought 2 years ago and while it works fine, it lacks every single feature out there that the other high end things have. I used to be able to say that it had the most courses, but apparently that is not the case anymore either. I think it is time to upgrade. Looks a lot like an ipod. Thank You Thank You Thank You. I have been waiting for this review for over a month now and you guys delivered like you always do. Now I can go and get one thanks. Awesome and in depth. I have $200 on a gift card to the golf store. This might be mine. I’m starting to kick myself for getting the sky caddie SG5 and not holding off. I did note that the lastest upgrade from Sky Caddie has similar features, fairway layouts, and green layouts like the newer gps units. Oh well, I have another year and a half on my service to decide if I’ll change out or re-up. Question, i set this up on my desktop. No major issues. Since I have a laptop that I travel with can I also register /download “Synch” software on my laptop as well? We have it running on two pc’s with no issues. Good review. I’ve been looking forward to seeing how this one performs (and the Garmin Approach G5) to see how they compare with some of the other units you’ve reviewed. I especially like the no-subscription part, but do wish the battery life was a little better just in case I ever had a chance to play 2+ rounds in a day. Looks like a good product. I have a question about the touch screen: is it similar to the iPhone/iPod touch screen or more like other touch screens that have a bit of “give” and are plastic? I would say it is not cheap feeling if that is what you are asking. But one thing that I think it has going for it over the Ipod is that we had no issue using it with our gloved hand. With the Iphone and Ipod devices we tested, you cannot use your gloved hand. Isn’t this the GPS that allows you to place the actual hole position with the touch screen ? If you have a hole location sheet that measures, you can get an exact distance by moving the cursor to the location on the sheet. You can get some very cool yardages with this unit. Would you say that you like this better overall than the uPro and Bushnell devices that you gave high praise over the past year? I am just starting to look into a GPS possibility. Have you tested any iPhone apps? I’m curious if the GPS in my iPhone would be anywhere near as accurate as these purpose-built devices. I would say that all three of them are great devices and are very different. UPRO does what it does well, but with the new rising costs of the Pro Courses on their device, it may take a back seat to the other two you mentioned. The Bushnell is a subscription device so there are added costs, but it is a top notch device and has every feature we would want in a GPS device. This OnPar is a great unit and while the touchscreen is not going to be for every user, if you like the interface it is a great device. Also make sure you check the library of all the devices you are checking and make sure that your courses are in their database. I just received my OnPar today. I installed the onpar synchro- but had problem downloading- so I removed the onpar synchro with the thought of reinstalling it- but I can’t- seems that I have to register again before I can reinstall the program- do you any link to the software? Please be aware that the battery on this device is NOT replaceable. This is according to the Support group at http://www.onpargps.com. The Sales guys then added that it is not replaceable “at this time.” They add that the battery is expected to last 5 to 7 years. There was no time frame given for when this issue will be resolved. Is there a lock button on this device so if you put it away between shots it wont be pressing buttons in your bag? Or do you just turn it off? What is the course capacity? Where can I find a list of courses available as of June 16, 2010 (mostly intersted in my area for now)? I have had this device for over one year, when it works it is great, however I ofter encounter problems, the unit seems to loose gps signal and then lock up requiring a reboot. I have had problems loading some courses this seems related to some disk error on the device. When this happens tech support suggested removing all the courses and data and perform a fresh synch. As I said when this unit works I thing it is the best, but once it starts acting up you just have to put it away go home and re synch. Be Careful. Glass breaks very easily. When that happens the device it ready for the trash. Not covered by warantee. I thought wow what a cool gps. Until i went to use it. screen locks up to a freeze and then clears the scorecard. not that accurate, distance never seems to stay stable and flucuates back and forth. I just went to download new courses and there was another fetal error with it. As for the customer service, they are horrible !! i have tried to work it out but they blame the store i bought it at and refuse to exchange it. the store wont take back the product since return policy is past. So i have a piece of crap that i wasted 400.00 bucks on only for it to last just past the return policy!!!!! period. as for onpar gps you look real neat with fancy pics but i need a product that works well with great cutomer service and wont fall apart on the inside like this one. I have the same problems as you. Im on the course shooting good at 7th hole, then I try to open it but it was closed. Sh*t. Lost my scorecard, tracked shots everything. Back in my bag, f**ck it!!!!! Also, some courses (most of them) aren’t available because I live in Canada and when they’re available, they have errors. I’ll buy a Bushnell V2 rangefinder untill they change the software, tired. I also have had problems downloading courses and after much frustration found out that the courses were corrupted. This prevented other courses from being downloaded. I called the service telephone number and left a message with my phone number for a return call. Never got that. Also sent email with the problem and never got reply from that either. Sounds like we’re on our own. I wonder if the company is still in business??? and no matter what I do I can not download more courses although there are only about a dozen loaded. have someone call me. Ha, what a joke even though I verified the cell number twice. to buy other devices that are more reliable. I have had the onpar gps for a while. I recently went to upgrade my courses only to find I needed to upgrade the software to be compatible with Windows 7 – 64 bit. Now I have upgraded the software and started downloading the courses. I have received an error that will not allow me to even view the get past the error screen. Has anyone seen this error? It will not allow me to scroll through the rest of the screen to view the remaining error. I too i’am haveing the same trouble as Mike march14,2011. icall tec. and they did not call me back sent a e-mail with all the errors waiting to hear back.what little i play with this i like but what good is it if you cant even get to the coures with it to play. 4) Run OnPar Synchro and synch your device. I just got an email they are going out of business..not surprised with the horrible customer service. I dont understand why they cant just change their business model, change the price, start charging a small fee to NEW buyers. So shady I feel ripped off and the kicker they want me to switch to some other gps unit. I was a very early buyer a little earlier than you. they had virtually no courses mapped. Customer service was with their C-level exc. LOL (never a good sign) What are you going to do with yours? how do I change the battery on my OnPar?